There’s a war going on out there, and it’s called Marketing Cloud. The top players are (in random order) SalesForce, Oracle, IBM and Adobe, and each and every one of them lays claim to being the thought leader in this rapidly emerging segment. Adobe may have a different background than the others, but is no exception. The company will tell you at every possible occasion that they have transformed themselves from Acrobat and Photoshop to a full-blown cloud-solution provider for marketing and advertising, and are a self-declared visionary leader in the field. You can debate the leadership part, as they are not the only ones. It is hard to ignore the visionary bit though since the Father of PDF is very vocal about it. They claim to have seen things coming before other players did, notwithstanding the fact that their vision is still evolving. This state of affairs is now further confirmed by the quickly progressing integration of Sensei, Adobe’s Machine Learning component. 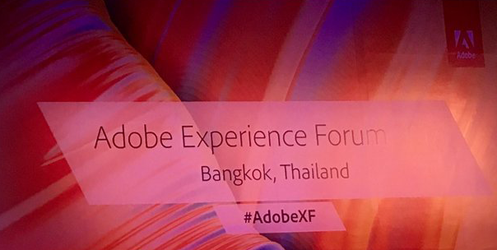 At the Adobe Experience Forum in Bangkok, Sensei was the driving force behind many of their cloud solutions. Here is how Adobe claims that will change marketing and advertising forever. (1.) Adobe’s DMP tracks users coming to your site or mobile app. Based on cookies and tags, it can figure out if you are male or female, probably your age and with a bit of luck a few other facts. (2.) Sensei will then scan the Adobe stock photography library and come up with an image of e.g. a person that is in the same age category, presented in a similar lifestyle situation as your visitor. This relatively simple scenario is, as they claim, just the beginning. Similar things can and will be done for content, page lay-out and site navigation. No two sites will be the same if it depends on them. While Sensei, and other offerings like IBM’s Watson and Salesforce’s Einstein, can certainly do this stuff now and in even more sophisticated ways in the future, there are quite a few things to consider before we can all have a totally customised experience for every single citizen on this planet. Here is what in my mind needs to be considered. The idea of a banner that uses a targeted image, based on the segment you belong to, or in the future, even on individual characteristics is great. The question is though, how do you test this and determine whether all images suit the visitor. Secondly, how do you ensure that they meet brand guidelines and design quality. When you target for a dozen segments, testing and QA is probably still manageable. But if the number of images is going to be in the thousands, this is humanly impossible. Oh wait, maybe AI can help in that case? The point here is that both the banner design and the image selection should be carefully optimised for this type of experience optimisation. This requires a complete new way of thinking and will require a lot of learning by doing. The question for any business is, do you want to use your existing customers base as guinea pigs. Sitting in an Asian country, watching personalisation of banners at scale is great, but the stock images in Adobe’s library present primarily non-Asian persons. This is of course something that can be ‘fixed’. It is just a question of adding new relevant images. At a global scale this can be more challenging as countries and cultures differ. In some places, you don’t show people barefoot. In others, women need to wear a headscarf, or one needs to avoid images of bottles or cigarettes. While all of this can technically be fixed, it will require careful image selection and even more so, careful asset development. The data that Sensei taps into is clearly skewed to the US as well and is of course primarily in English. The Adobe experts admit that this might limit the effectiveness of their DMP and specifically Sensei in Asia. Having said that, it is probably only a matter of time before Sensei and their DMPs will be stocked up with sufficient Asian data. Adobe is working hard at increasing the client base for their Cloud solutions and through that feed these platforms with Asian data. According to Adobe, Sensei will also be able to handle multiple languages, something of paramount importance in the APAC region. The use of AI to optimise a web or app experience this way is only just the beginning, according to our Acrobatic friends. Adobe presented additional innovations for which the audience could vote. Sensei assisted optimisation of geo-fenced push messaging is one of them. When you have selected e.g. 3 areas where you have a restaurant for which you want to push messages out as soon as people are nearby, Sensei can crawl the web and figure out which other nearby areas also trigger searches for your type of restaurant, or even more specifically your favourite restaurant, even though the place might not be in the immediate vicinity. These additional geo-fenced areas can increase the effectiveness of your message or ads drastically. Another demo focused on AI assisted automated optimisation of recipes on a food blog, depending on how you land on the site. When you are vegetarian e.g. the recipes containing meet would automatically be supressed or pushed out to another section of the blog. So it looks like we are seeing the start of an era where no two sites will be the same, even if they are on the same URL. The jury is still out there on whether this is a good thing or not. It does open new ways of building experiences though and will have to lead to new creative approaches to marketing and advertising. Adobe now has its Sensei, SalesForce hews to Einstein, and IBM touts Watson. One wonders when Oracle will come up with a catchy names for their resident brains. Heisenberg, perhaps? Anyway, now the only thing we poor consumers need to keep up with this is an AI assisted brain. 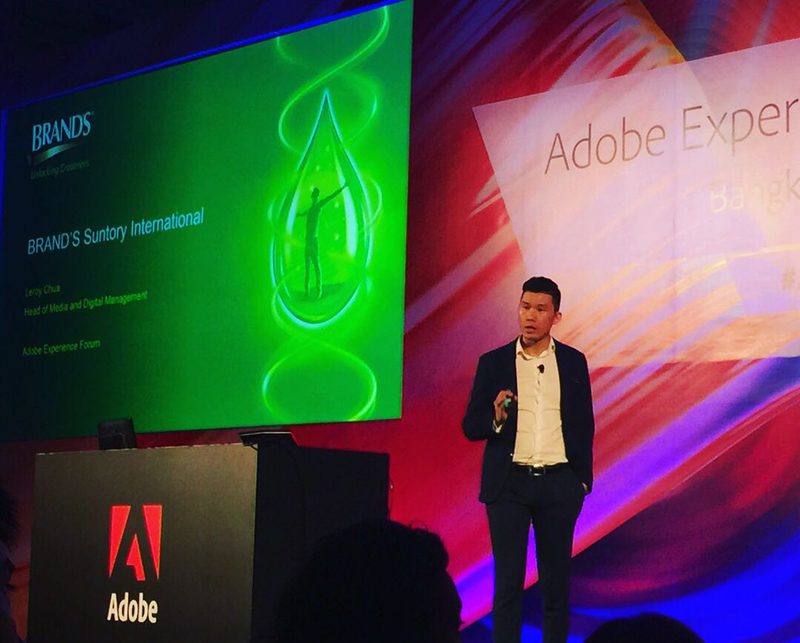 Leroy Chua, Head of Media and Digital Management of BRAND’S Suntory International, presenting at the Adobe Experience Forum in Bangkok. Besides Editor of AdAsia, Matthieu also holds the position of Director Digital Activation for Brand’s Suntory, based in Bangkok. This article represents only AdAsia’s observations on the topics presented and these are not necessarily endorsed by Brand’s Suntory.